Chevron Corporation (NYSE: CVX) is the world's fourth-largest non-government energy company. Headquartered in San Ramon, California, U.S., and active in more than 180 countries, it is engaged in every aspect of the oil and gas industry, including exploration and production, refining, marketing and transport, chemicals manufacturing and sales, and power generation. 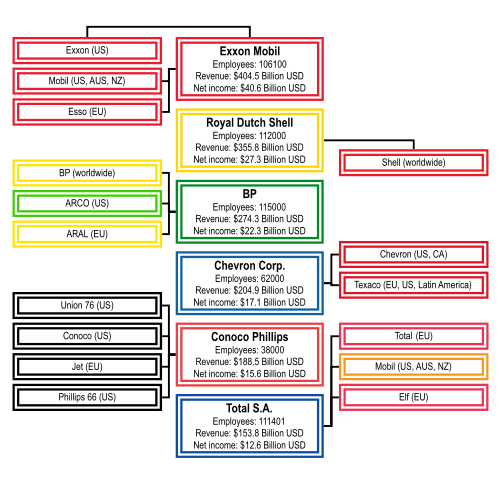 Chevron is one of the world's six "supermajor" oil companies. Chevron originated as the Pacific Coast Oil Company, founded in 1879 to develop the Pico Canyon Oilfield north of Los Angeles. It was purchased by Standard Oil in 1900, and after the antitrust breakup of Standard Oil in 1911, it became Standard Oil of California, or “SoCal.” During the 1930s, SoCal geologists discovered oil reserves in Bahrain and Saudi Arabia and the company began its international operations. Socal changed its name to “Chevron Corporation” after it acquired Gulf Oil in 1984, the largest merger in history at that time. Chevron’s oil production activities have resulted in numerous environmental law suits against the company, and it has also been criticized for its social policies in some countries. Defenders of Chevron’s environmental record point to recent changes in the corporation, particularly its pledge, as of 2004, to combat global warming. Chevron has taken steps to reduce emissions of greenhouse gases and is investing US$300 million per year into alternative fuel sources. Chevron employs more than 59,000 people worldwide (of which 27,000 are U.S.-based) and about 5,800 service station employees. It had approximately 10.8 billion barrels of oil-equivalent net proved reserves at December 31, 2007. Daily production in 2007 was 2.62 million net oil-equivalent barrels per day. Approximately 70 percent of that volume occurred outside the United States in more than 20 countries. In addition, the company had a global refining capacity at year-end 2007 of more than 2 million barrels (350,000 m³) of crude oil per day. The company has a worldwide marketing network of approximately 24,000 retail sites on six continents, including those of affiliate companies. The company also has interests in 13 power generating assets in the United States and Asia. The company marked its 125th anniversary in 2004, tracing its roots to the discovery of an oilfield in Pico Canyon (now the Pico Canyon Oilfield) north of Los Angeles. This find led to the formation, in 1879, of the Pacific Coast Oil Company, the oldest predecessor of Chevron Corporation. In 1900, Standard Oil purchased Pacific Coast Oil Company, and six years later merged it was merged with Standard Oil’s West Coast marketing operations to form Standard Oil Company (California). Amid the antitrust breakup of John D. Rockefeller's Standard Oil company in 1911, it became Standard Oil of California, or “SoCal,” an autonomous entity with its own oil fields, pipelines, tankers, refineries, and markets. In 1926 it purchased Pacific Oil Company, previously owned by Southern Pacific Railway, and extended its pipelines and refineries from California to Texas. Standard Oil of California, or SoCal, was one of the "Seven Sisters" that dominated the world oil industry during the early twentieth century. In 1933, Saudi Arabia granted SoCal a concession to find oil, which occurred in 1938. In the early 1950s, SoCal discovered the world's largest oil field (Ghawar) in Saudi Arabia. SoCal's subsidiary, California-Arabian Standard Oil Company, evolved over the years, becoming the Arabian American Oil Company (ARAMCO) in 1944. In 1973, the Saudi government began buying into ARAMCO. By 1980, the company was entirely owned by the Saudis and in 1988, the name was changed to Saudi Arabian Oil Company (Saudi Aramco). The Texas Fuel Company, which started out in three rooms of a corrugated iron building in Beaumont, Texas, in 1901, became known as The Texas Company and eventually Texaco. After SoCal geologists discovered oil reserves in Bahrain and Saudi Arabia in the early 1930s, Texaco and SoCal formed a joint marketing enterprise in 1936, the Caltex Group of Companies. In 1939, the California company began operations in Louisiana and later offshore in the Gulf of Mexico. Caltex began Canadian production in 1941, and later formed subsidiaries and affiliates in Libya, Nigeria, Spain, Indonesia, and other parts of the world. In 1961, Caltex purchased Standard Oil Company (Kentucky). The purchase of Gulf Oil by Standard Oil of California in 1984 was the largest merger in history at that time. Because of its size, SoCal divested many of Gulf's operating subsidiaries and sold some Gulf stations and a refinery in the eastern United States to satisfy U.S. antitrust requirements. As part of the merger, SoCal changed its name to Chevron Corporation. In June 1998, Dynegy, Inc. (NYSE: DYN) was created by the merger of Chevron's former natural gas and natural gas liquids businesses with Dynegy's predecessor, NGC Corp. (formerly NYSE: NGL). NGC had been an integrated natural gas services company since 1994. In a merger completed February 1, 2000, Illinova Corp. (formerly NYSE: ILN) became a wholly-owned subsidiary of Dynegy Inc., in which Chevron also took a 28 percent stake. In 2001, Chevron Corporation acquired Texaco to form ChevronTexaco. 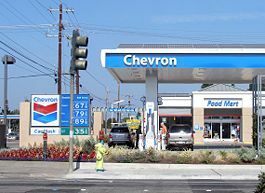 On May 9, 2005, ChevronTexaco announced it would drop the Texaco moniker and return to the Chevron name. Texaco remains as a brand name under the Chevron Corporation. On August 19, 2005, Chevron acquired the Unocal Corporation. Unocal's large South East Asian geothermal operations made Chevron the world's largest producer of geothermal energy. Chevron was headquartered in San Francisco for nearly a century before it relocated its headquarters across the bay to [[San Ramon, California. Its original headquarters were at 225 Bush St., built in 1912. Chevron's headquarters buildings at 555 and 575 Market Street, San Francisco, built in the mid-1960s, were sold in December 1999. 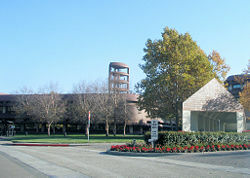 Chevron headquarters is now at 6001 Bollinger Canyon Road, San Ramon, CA. 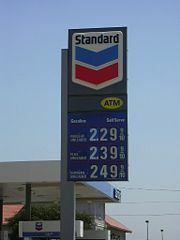 A Standard-branded Chevron station (with Chevron logo) in Fort Worth, Texas. 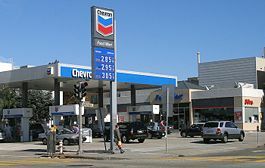 Chevron is the only brand of gas used by several automakers when testing vehicles, including General Motors and Toyota. (Ford also uses Chevron for testing despite a strategic alliance with BP.) In 2007, Chevron ranked fourth in brand loyalty for gasoline in America, while Texaco brand tied with Sunoco for second place. Chevron is the largest private producer of oil and gas in Kazakhstan and Thailand, and the top crude producer in Indonesia. In Australia, it is the largest leaseholder of undeveloped natural gas resources, and is also a top leaseholder in the Gulf of Mexico. From 2001 to 2007, Chevron increased its oil-equivalent resource base by about 1 billion barrels per year through its exploration programs. Chevron has invested more than US$1 billion in each of 40 projects, and over US$200 million in more than 35 projects worldwide. Natural gas now provides 23 percent of all energy consumed in the world. Chevron’s natural gas resources include significant holdings in Africa, Australia, Southeast Asia, the Caspian region, Latin America and North America. Chevron produces approximately 5 billion cubic feet of natural gas per day and expects to substantially increase this volume over the next decade. Regions with natural gas surpluses are often located at great distances from the areas where it is in greatest demand. Chevron uses the latest technologies to develop natural gas products, from conventional pipeline gas to liquefied natural gas (LNG) to gas-to-liquids (GTL). Cooled into a liquid, natural gas can be shipped safely in specialized tankers to gasification plants where it is heated to its gaseous state so it can be delivered to customers through pipeline systems. Chevron is also developing gas-to-liquids (GTL) technology, which can be used to create synthetic diesel fuel, lubricant base oils and naphtha from natural gas. GTL diesel delivers higher performance and has a lower environmental impact than traditional diesel fuels; it can be blended into conventional diesel to increasing the supply of fuel that meets stringent air-quality rules. Chevron is investing US$300 million per year into alternative fuel sources, and has created a biofuels business unit. In 2007, Chevron Corporation and US-DOE's National Renewable Energy Laboratory (NREL) announced that they had entered into a collaborative research and development agreement to produce biofuels from algae. Under the agreement, Chevron and NREL scientists will collaborate to identify and develop algae strains that can be economically harvested and processed into transportation fuels such as jet fuel. Chevron Shipping Company is a wholly owned subsidiary company which handles the maritime transport operation for Chevron Corporation. The fleet comprises crude oil and product tankers as well as three gas tankers operated by Chevron Shipping for other companies. The fleet is divided into two sections, U.S. and International. The U.S. fleet transports oil products from Chevron refineries to customers in the U.S. The ships are manned by U.S. citizens and are flagged in the U.S. The International fleet vessels are flagged in the Bahamas and have officers and crews from many different nations. The largest ships are 308,000 tonne VLCCs. The job of the international fleet is to transport crude oil from the oilfields to the refineries. The international fleet mans two LPG tankers and one LNG tanker. Chevron originally gave its ships names beginning with "Chevron," such as the Chevron Washington and Chevron South America, or named them after former or serving Directors of the company such as Samuel Ginn and William E. Crain. A ship named after Condoleezza Rice was renamed Altair Voyager, in 2001, after a controversy over whether it was appropriate to name an oil tanker after President George W. Bush’s national security advisor. After the corporate merger with Texaco later in 2001, the entire fleet was renamed; international ships after celestial bodies or constellations (Orion Voyager, Altair Voyager and so pn) and U.S. ships after states (Washington Voyager, Colorado Voyager and so on). From 1965 to 1993, Texaco participated in a consortium to develop the Lago Agrio oil field in Ecuador. It has been accused of causing extensive environmental damage by these operations, and faces legal claims from both private plaintiffs and the government of Ecuador. The case has been widely publicized by environmental activists. Chevron claims that it is being unfairly targeted as a deep pocket defendant, when the actual responsibility lies with the government and its national oil company. Chevron’s activities in Richmond, California have been the subject of ongoing controversy. A project there houses over 11 million pounds of toxic materials and has been responsible for over 304 accidents. In 1998, Chevron’s Richmond refineries were forced to pay $540,000 in penalties for illegally bypassing wastewater treatments and failing to notify the public about toxic releases. Overall, Chevron is listed as potentially responsible for ninety-five Superfund sites—locations for which the U.S. Environmental Protection Agency (EPA) has earmarked funds for cleanup. In October 2003, the state of New Hampshire sued Chevron and other oil companies for using MTBE, a gasoline additive that the attorney general claimed polluted much of the state's water supply. Chevron’s African operations have also been criticized as environmentally unsound. In 2002, Angola became the first African nation ever to fine a major multinational corporation operating in its own waters when it demanded two million dollars in compensation for oil spills allegedly caused by Chevron’s poor maintenance. On May 28, 1998, local activists staged a demonstration to demand compensation for the use of their oil-rich land and took several individuals hostage on a private oil platform in the Niger Delta, Nigeria. Nigerian police and soldiers were allegedly flown in with Chevron helicopters. Soldiers shot at the activists and subsequently two activists (Jola Ogungbeje and Aroleka Irowaninu) died from their wounds. Chevron described the situation as "a violent occupation of private property by aggressors seeking to extort cash payments from the company." The Nigerian government reportedly depends upon oil production for 80 percent of its revenue. Amnesty International and other human rights organizations have condemned the Nigerian government for its reported harsh treatment of environmentalists, and for failing to provide sanitation, a clean water supply and adequate schools for the inhabitants of the regions where the oil is produced. Although revenue from oil supports the MPLA government in Angola, Chevron has been accused of not fulfilling its community responsibilities in the province of Cabinda, Angola. Chevron's employees live and work in isolated, self-sufficient compounds such as the Malongo terminal, supplying their own services and importing groceries and other commodities duty free from overseas, so that there is little economic impact on local markets and infrastructure. In a survey, Cabindans expressed their concern that the multi-billion dollar oil industry has not improved their daily lives. Chevron has taken steps to reduce emissions of greenhouse gases and pursue cleaner forms of energy. In a 2006 study, Ceres, a coalition of institutional investors and environmentalists based in Boston, ranked Chevron highest among U.S. oil companies for investing in alternative energy sources and setting targets for reducing its own emissions. Chevron is the world's largest producer of geothermal energy, providing enough power for over 7 million homes in Indonesia and the Philippines. ↑ Chevron.com, Company Profile. Retrieved December 3, 2008. ↑ Chevron.com, Chevron Products. Retrieved December 3, 2008. ↑ BBC, Chevron claims energy debate (February 19, 2006). Retrieved December 3, 2008. ↑ San Jose Business Journal, Chevron leaving San Francisco—Silicon Valley. Retrieved December 3, 2008. ↑ US-Highways.com, Standard Oil Today. Retrieved December 3, 2008. ↑ Brandkeys.com, Gas Pains, The Keyhole: Peeking at 21st Century Brands (May 17, 2007). Retrieved December 3, 2008. ↑ Chevron.com, Natural gas. Retrieved December 3, 2008. ↑ NREL, Chevron and NREL to Collaborate on Research to Produce Transportation Fuels using Algae, National Renewable Energy Laboratory (October 31, 2007). Retrieved December 3, 2008. ↑ San Fransisco Chronicle, Chevron redubs ship named for Bush aide Carla Marinucci, San Francisco Chronicle (May 5, 2001) Retrieved December 3, 2008. ↑ University of Michigan, Environmental Justice Case Study: Richmond, CA. Retrieved December 3, 2008. ↑ EPA, CHEVRON RICHMOND REFINERY TO PAY $540,000 ENVIRONMENTAL PENALTY, Newsroom, U.S. EPA (October 15, 2998). Retrieved December 3, 2008. ↑ Co-op America, Responsible Shopper Profile: Chevron. Retrieved December 3, 2008. ↑ Knowmore.org, Chevron Texaco Corporation. Retrieved December 3, 2008. ↑ BBC, | Business | Angola fines Chevron for pollution BBC NEWS (July 1, 2002) Retrieved December 3, 2008. ↑ DeomcracyNow.com Transcript of Drilling and Killing Documentary. Retrieved December 3, 2008. ↑ PointofLaw.com, "Nigerians pull half of claims in Chevron suit," Walter Olson (April 7, 2008). Retrieved December 3, 2008. ↑ San Francisco Chronicle, Chevron can be sued for attacks on Nigerians, U.S. judge rules. Retrieved December 3, 2008. ↑ Bob Egelko, Nigerians pull half of claims in Chevron suit, San Francisco Chronicle. Retrieved December 3, 2008. ↑ Amnesty USA, Nigeria Human Rights. Retrieved December 3, 2008. ↑ American University, Angola: Cabinda, The Inventory of Conflict & Environment (ICE). Retrieved December 3, 2008. ↑ David R. Baker, Quest for clean energy Chevron, PG&E cited for positive steps to combat global warming, San Francisco Chronicle (March 22, 2006). Retrieved December 3, 2008. ↑ U.S. Department of Justice, CHEVRON AGREES TO RECORD $7 MILLION ENVIRONMENTAL SETTLEMENT. Retrieved December 3, 2008. ↑ EPA, U.S. Announces Clean Air Agreement with Chevron U.S.A.—Petroleum Refiner to Reduce Air Emissions at Refineries in Four States. Retrieved December 3, 2008. ↑ David R. Baker, Quest for clean energy/Chevron, PG&E cited for positive steps to combat global warming, San Francisco Chronicle. Retrieved December 3, 2008. ↑ Chevron, Geothermal Energy. Retrieved December 3, 2008. Baker, David R. Quest for clean energy Chevron, PG&E cited for positive steps to combat global warming. San Francisco Chronicle (March 22, 2006). Retrieved December 3, 2008. Chevron. Geothermal Energy. Retrieved December 3, 2008. EPA. U.S. Announces Clean Air Agreement with Chevron U.S.A. - Petroleum Refiner to Reduce Air Emissions at Refineries in Four States. Retrieved December 3, 2008. Goodman, Amy, and David Goodman. The Exception to the Rulers: Exposing Oily Politicians, War Profiteers, and the Media That Love Them. New York: Hyperion, 2004. ISBN 1401301312. Houck, John W., and Oliver F. Williams. Is the Good Corporation Dead? Social Responsibility in a Global Economy. Lanham, Md: Rowman & Littlefield, 1996. ISBN 0847682099. Mattera, Philip. World Class Business: A Guide to the 100 Most Powerful Global Corporations. A Henry Holt reference book. New York: H. Holt, 1992. ISBN 0805016813. Sampson, Anthony. The Seven Sisters: The Great Oil Companies and the World They Shaped. New York: Viking Press, 1975. ISBN 0553234695. U.S. Department of Justice. CHEVRON AGREES TO RECORD $7 MILLION ENVIRONMENTAL SETTLEMENT. Retrieved December 3, 2008. This page was last modified on 10 February 2017, at 16:17.